Looking for some car-action this 4th of July weekend? Look no further than Redline Track Event’s Liberty Grand Prix! 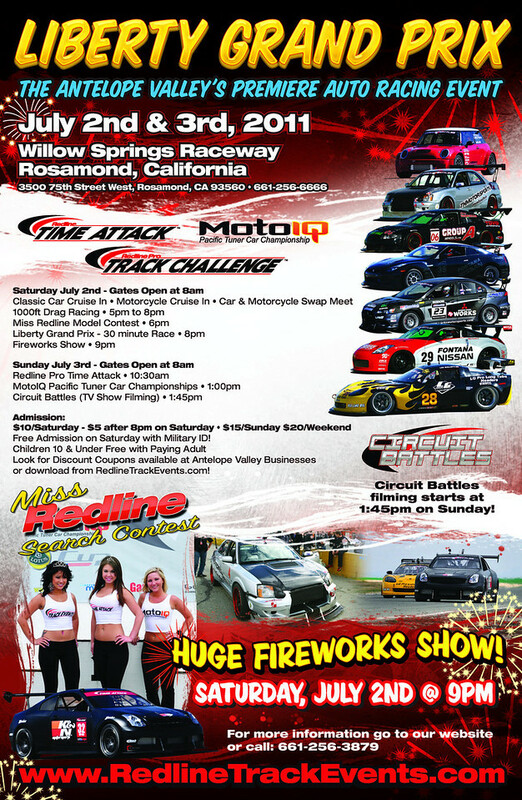 For those of you craving some wheel to wheel action, the Liberty Grand Prix at Willow Springs International Raceway will be hosting a DOUBLE HEADER MotoIQ Pacific Tuner Car Championship weekend!!! Race #1 will take place at 8pm, Saturday, July 2nd as “The Liberty Grand Prix” during twilight! Yeah, that’s right….racing into the night! Race #2 will take place at 1pm, Sunday, July 3rd. DOUBLE-HEADER, DOUBLE POINTS WEEKEND! Check out all the planned events below and don’t forget to print out your $5 coupon! Hope to see you all at the track next weekend!